Kentucky’s state government fully supports vocational and trade programs that produce the skilled workers and trade professionals the state demands. Kentucky’s primary economic drivers center on manufacturing, specifically the production of motor vehicles—the state ranks third in the nation in vehicle production and is home to nearly 475 motor vehicle-related facilities. Coal production is another major industry, and the services sector is thriving. Use this guide to find information about Kentucky’s vocational and trade schools, job opportunities, and resources for prospective students and graduates. Kentucky's trade and vocational schools are as widespread as they are practical. As a result, students can choose from many community colleges and trade academies in order to take advantage of high-growth areas in the state, such as manufacturing and allied health professions. 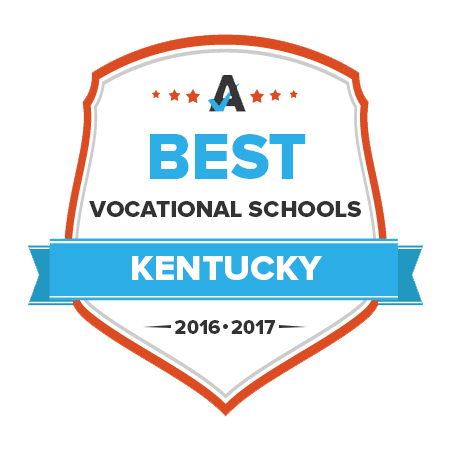 Our rankings of Kentucky trade and vocational schools include only institutions that are accredited and offer placement services for graduates. Jefferson boasts small class sizes and faculty that have worked in the technical fields they teach. Students with associate degrees in high-demand fields such as early childhood education or nursing can immediately enter the workforce upon graduating. Those who choose to pursue a bachelor's degree at a four-year institution can transfer to any college in Kentucky. Academic Program Plans (APPs) are available to help students determine which credits they will have to earn in order to achieve their desired degree. The campus hosts many organizations, clubs and associations, which students can use to network and connect. After earning a two-year associate degree, graduates from Maysville Community and Technical College may enroll in any college in Kentucky to complete a four-year bachelor's degree. The Maysville campus, the Licking Valley campus, the Montgomery campus and the Rowan campus all offer a wide range of programs of study. Students may be eligible for credits for prior learning, and others can enroll in a dual credit program. The Accelerating Opportunity Kentucky program mixes career training with additional education support. The campus, which also offers several certificate programs, provides students with tutoring services upon request. Among the degrees that students may pursue at Owensboro Community and Technical College are Associate in Arts, Associate in Science, Associate in Applied Science and Associate in Fine Arts. In the Go2Work program, the school partners with a variety of local businesses that favor graduates for immediate employment. Other graduates may move on to senior learning institutions to complete four-year degrees. High school students can get a head start by participating in the Discover College program. The school works to prepare prospective students with the COMPASS College Connection Camps program, which initiates students as to what is required to succeed at the college. Students who earn a two-year associate degree from Somerset Community College are eligible to transfer to any four-year college in Kentucky to complete their bachelor's degree. Other students, such as those who graduate with degrees in medical information technology and early childhood education, can enter the workforce immediately. SCC also offers Learning Commons, which includes tutoring services, interlibrary loan, eBooks and library instruction. The tobacco-free campus is home to a variety of clubs and associations, a student newspaper, a theater and a fitness center. Students can always make an appointment to speak with an advisor for help with their academic careers. Bluegrass Community and Technical College works to help students transfer to four-year schools once they graduate with an associate degree, which can be achieved through roughly four dozen areas of study. Undecided students should pursue either an Associate in Fine Arts degree, an Associate in Arts degree or an Associate in Science degree. The school also offers dozens of technical programs and provides assessment testing as well as enrollment assistance. Among the honors societies, programs and awards found on campus are BCTC Scholars, Phi Theta Kappa, Honors Program and Who's Who Among Students. Aspiring automotive technicians, construction workers, truck drivers, nursing assistants, and business professionals need quality hands-on training to excel in their jobs. Through accredited vocational and trade programs, students get a well-rounded education by taking classes that combine theory with hands-on lab and clinical experiences. A good starting point is at one of more than 50 area technology centers in the Kentucky Tech System; classes are also offered online and are free to high school students. Kentucky students can also find vocational education options through the Kentucky Community and Technical College System. Use the search tool below to find the vocational and trade schools in Kentucky that best match your career goals. The Perkins Collaborative Resource Network reports that 49,535 students in Kentucky were enrolled in career and technical education (CTE) programs in the 2014-2015 school year. High school students who take three or more CTE courses have a 98 percent graduation rate—nearly 10 percent higher than the state average. According to a report sponsored by the Kentucky Department of Education, 9,418 students graduated from a Kentucky community college and 6,948 graduated from a Kentucky tech center in 2013. Employment of healthcare practitioners and technical occupations, office and administrative support occupations, and sales-related occupations is expected to account for 33.6 percent of Kentucky's total job growth through 2022. Technical certificates or associate degrees are available from 23 schools in Kentucky—the Kentucky Community and Technical College System, which has multiple locations across the state, accounts for most of these programs. Students can also complete their educations at local universities that offer associate-level degrees in trade disciplines. The chart below illustrate how Kentucky ranks in different types of undergraduate certificate and degree programs. Kentucky’s Workforce Intelligence Branch reports that one-third of all jobs created through 2022 will be from three main occupational groups: healthcare, office and administrative support, and sales. In fact, seven of Kentucky’s top ten employers are in the healthcare industry, including Our Lady of Bellefonte Hospital and Humana, Inc. Rounding out the list are GE Appliances and Toyota, offering employment opportunities in manufacturing, and the service-oriented careers at UPS. The table below shows projected increases for some of the most high-growth careers for those with a postsecondary education and associate degree, as well as wage information for each occupation. Residents of Louisville can complete a career and technical education program at a number of state-approved trade schools and community and technical colleges scattered throughout the city. Louisville is home to several beauty schools, including Paul Mitchell and Trend Setters’ Academy that prepare students for a cosmetology license. The Galen College of Nursing-Louisville offers several nursing programs, while the Jefferson Community and Technical College, one of 16 colleges in the Kentucky Community and Technical College System, offers dozens of programs. The services sector is the strongest economic force in Greater Louisville, with the majority of jobs available in the tourism industry. Louisville also serves as the headquarters for several Fortune 500 companies, including Yum! Brands, Inc., Kindred Healthcare, Inc., Papa John’s International and Humana, Inc. Some of the largest warehousing and distribution companies in Louisville include UPS Supply Chain Solutions and Parker Commercial Storage & Distribution. Trade schools in Kentucky can provide the hands-on training needed to excel at these companies as well as job placement or internship opportunities for an easy transition into the workforce. Comprehensive website that features regional economic information, statistics about area businesses, and a section dedicated to workforce solutions with resources for both job-seekers and employers. Job search database for Kentucky residents. Includes resources for exploring careers and education opportunities. Statewide agency that advocates for postsecondary and adult education programs, monitors and approves programs at public institutions, and reviews performance metrics. Sixteen colleges and more than 70 campuses make up the state’s community and technical college system. Provides information about educational programs, CTE professional organizations, and student organizations for those enrolled in a CTE program. Includes resources and tools for prospective students and job-seekers. Associated with the Kentucky Department of Education, this office is responsible for overseeing all activities of the Kentucky Tech school district. The website provides information about federal programs, school services, and program assessment guidelines. A comprehensive report compiled by Kentucky’s Workforce Intelligence Branch, profiling some 150 careers to offer information on employment opportunities and growth.